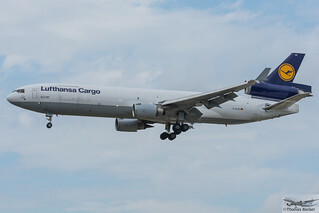 Lufthansa Cargo McDonnell Douglas MD-11F D-ALCE Merhaba Turkey is approaching runway 25L in Frankfurt. c/n 48785 (l/n 629) has had its first flight in June 1998 and was delivered to LH Cargo on 22.10.98. The jet is powered by 3x General Electric CF6-80C2D1F turbofans. This is flight LH8415 from Guangzhou (CAN).